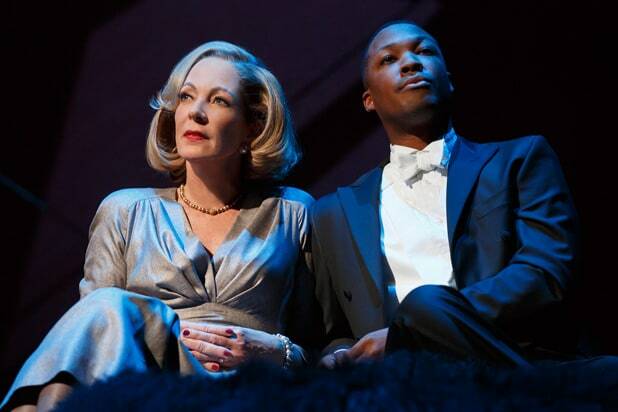 The good news on the Broadway revival of “Six Degrees of Separation” is great news. Twenty-seven years after the debut of John Guare’s comedy of manners and mores in Manhattan, “Six Degrees” retains its place as one of the great American plays of the late 20th century. The revival, which opened Tuesday at the Barrymore Theatre, also is a reminder of a time in the theater when two- and three-handers did not dominate the nonprofit world. True, Lincoln Center Theater, which originally produced the Guare play, is now staging a new American drama, “Oslo,” with a cast of 18. The cast of 18 in “Six Degrees” is especially astounding because it is possible to imagine the play with just its three principal characters: Ouisa and Flan Kittredge, the art-dealer couple living on the Upper East Side in 1990, and the young black man Paul, who is the alleged son of Sidney Poitier. The thing is, without the other 15 actors, we’d miss the community that Paul so desperately wants to be a part of. He not only yearns to be Ouisa and Flan’s son, he wants to belong to their world of wealth, grace, privilege, elegance, and entitlement. Who wouldn’t? Guare’s insightful portrait of that high society survives even Trip Cullman’s far too brash direction of this revival. Memory can be a tricky thing, but one thing Stockard Channing and John Cunningham managed to do in the original LCT production as Ouisa and Flan (only WASPs could tolerate such names) was to give the impression of one big embrace. It wasn’t only Paul they welcomed into their fabulous Fifth Avenue apartment with its two-sided Kandinsky painting. They welcomed the audience, too, since Ouisa and Flan address us throughout much of the play. In addition to possessing innate charm, they are also money-obsessed people to whom art no longer means much, except what selling it can buy them. And as played by Channing and Sutherland, this couple was charming, polite, delightful, and you understood why Paul would be attracted to them. Cullman directs “Six Degrees” as a not very sophisticated farce, especially in the play’s first half. Allison Janney and John Benjamin Hickey are diverting as Ouisa and Flan; they display razor-sharp timing, but they go for the laughs by stressing the characters’ materialism. Paul is no doubt attracted to their wealth. He would never be attracted to them as people. The broadness of these two performances also undercuts the role of Paul, who is the alpha character here. He’s the one who’s supposed to dominate as he cleverly manipulates his way into the Kittredge home with breathtaking speed. Despite the unnecessary competition from Janney and Hickey, Corey Hawkins (“Straight Outta Compton”) immediately takes focus, keeps it and even manages to give a slyly malevolent undertone to what could be Paul’s attraction to Ouisa. Or what he wants Ouisa to think is his attraction to her. Two of Ouisa and Flan’s friends are also taken in by Paul’s charade, and unfortunately Lisa Emery and Michael Countryman’s performances turn them into repellent caricatures. Even coarser are the portrayals of the two couples’ respective children (Colby Minifie, Keenan Jolliff, and Ned Riseley). The kids’ self-indulgent showdown with their parents brings down the house, but also cheapens the story. While there’s supposed to be only six degrees of separation between any two people in the world, there doesn’t have to be this wide a gulf between parent and child. After this onstage melee, Cullman’s direction relaxes considerably for the play’s second half. It has no other direction to go. A quiet respite is the performance of Chris Perfetti. He plays the college student (dubbed Henry Higgins) who knows all the East Side families whom Paul wants to meet and seduce. Perfetti and Hawkins’ slow, mutual manipulation of each other is this production’s high point. Paul’s seduction of a young couple (Peter Mark Kendall and Sarah Mezzanote) he meets in Central Park also brings down the temperature. Guare’s writing astounds in its swift handling of the exposition here, and Kendall’s retelling of his character’s quick demise brings a shocking reality to this utterly improbable tragedy. Also fine are Janney’s last moments on stage. Finally, she is the everymom of Paul’s dreams. Janney is one of those rare performers whose patrician bearing and honeyed vocals make us want to go on her journey the moment she appears. After all the early noise and hoopla of this production, her innate charms are given full room to breathe.